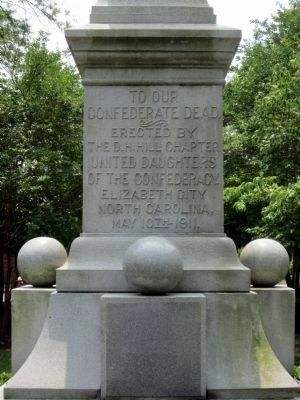 Erected 1911 by United Daughters of the Confederacy. Location. 36° 18.02′ N, 76° 13.324′ W. Marker is in Elizabeth City, North Carolina, in Pasquotank County. Marker is on East Main Street east of North Elliot Street, on the left when traveling east. Touch for map. Marker is in this post office area: Elizabeth City NC 27909, United States of America. Touch for directions. 300 feet away, measured in a direct line); a different marker also named A Town Divided (about 300 feet away); W. O. Saunders (about 500 feet away); First School (about 700 feet away); Culpepper’s Rebellion (approx. ¼ mile away). Touch for a list and map of all markers in Elizabeth City. More. 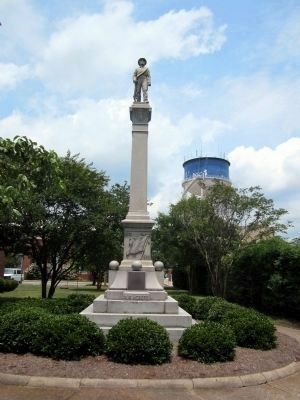 Search the internet for Elizabeth City Confederate Monument. Credits. This page was last revised on June 16, 2016. This page originally submitted on June 26, 2012, by Bernard Fisher of Mechanicsville, Virginia. This page has been viewed 560 times since then and 18 times this year. Photos: 1, 2. submitted on June 26, 2012, by Bernard Fisher of Mechanicsville, Virginia.